The State of Guerrero is a land filled with history and culture. 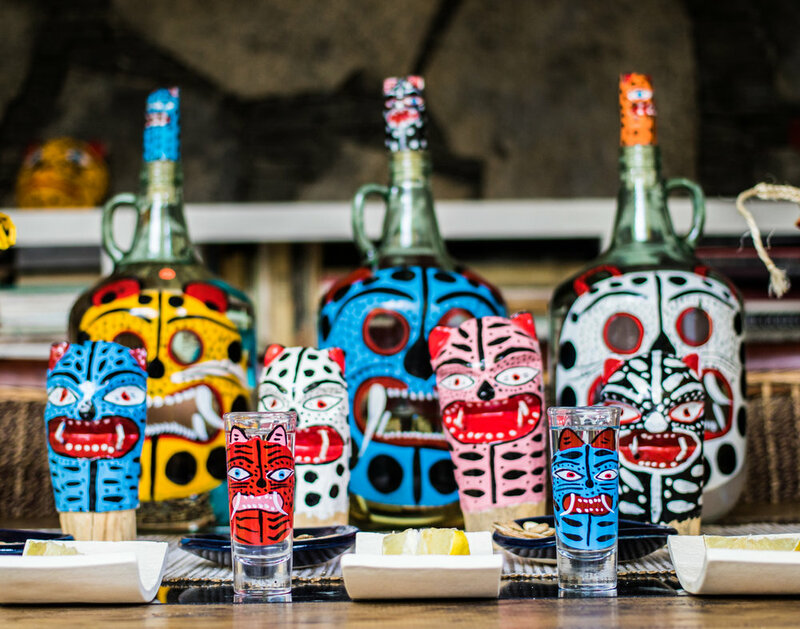 This project is a result of different influences, traditions and art styles that mix to create La Fiera Mezcal. One of our main goals has been bringing to Mexico City a fine selection of mezcal produced in small batches. 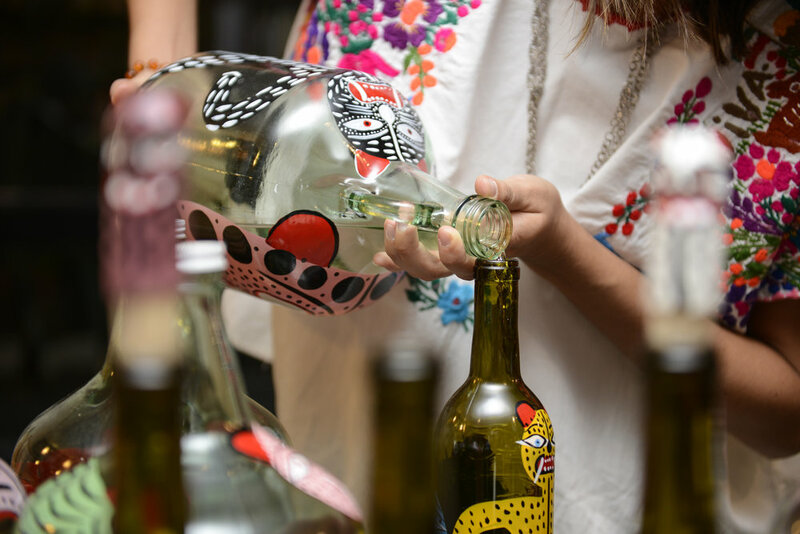 Made by different Mezcal Masters from the Center and Lower Mountain regions of the State of Guerrero, we bottle it in hand painted, unique design bottles made by families in the Lower Mountain as well as the Balsas River. 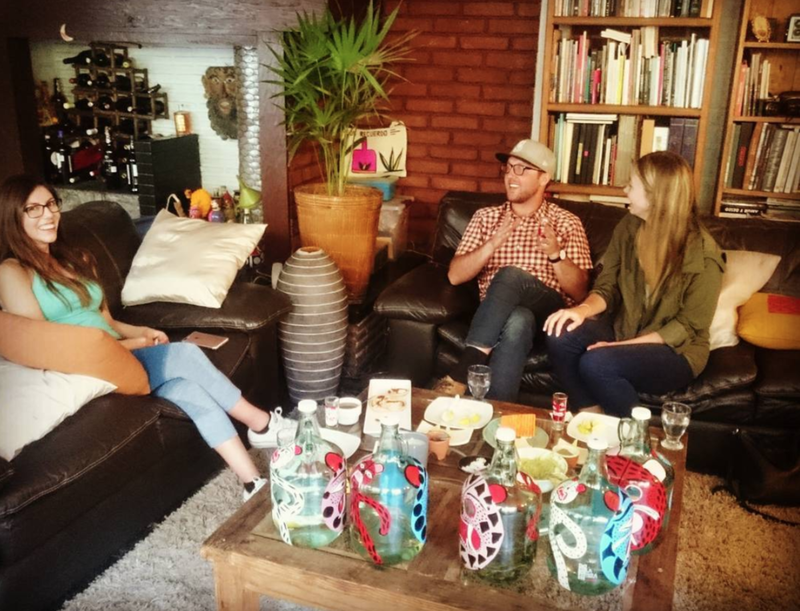 Are you visiting Mexico City and want to know more about mezcal produccion and culture? Would you like to learn different ways to recognise a good mezcal? We have years of experience hosting small private tasting for friends and family groups visiting our country. During the tasting we try a selection of natural, medicinal and curado mezcals. ※ Cooked in earth oven with red oak wood and hot river stones. Fermented in red oak wood barrels. Distilled in copper alembic. Strong. ※ Agave is harvested right before the flowering starts so the spirit is subtle sweet. Cooked in masonry oven with red oak wood. Fermented in red oak barrels. Distilled in copper alembic. Natural Mezcal "ojitos de agua"
※ Cooked in earth oven with red oak wood and hot river stones. Fermented in red oak wood barrels. Distilled in copper alembic. ※ Great balance between smoked, fermented and sweet taste. Soft mezcal. ※ Cooked in earth oven with tepeguaje and black oak wood and hot river stones. Fermented in red oak wood barrels. Distilled in copper alembic with copal tree wood. ※ Cooked in earth oven with tepeguaje and black oak wood and hot river stones. Fermented in red oak wood barrels. Distilled in copper alembic with copal tree wood. Slightly sweet. ※ During the distillation process, the mezcal master adds beef and goat meat, and a chicken breast hanging from the top of the alembic. The recipe also includes cinnamon, almonds, raisins, and homemade Mexican chocolate. ¡Unique special recipe! ※ Passion fruit is added once the mezcal is distilled..
※ Sweet. Yellow color. Great as a dessert mezcal. 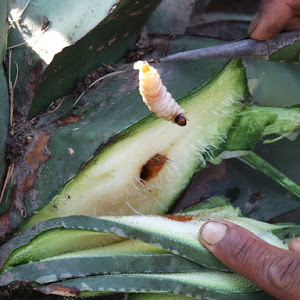 ※ Maguey worm is taken out from the agave and smashed and then added to the mezcal. ※ Distilled in March 2018. ※ Earthly flavor, slightly spicy. ※ Distilled in March 2018. Reposado in glass with Don Publio Natural Mezcal and Damiana added in August 2018. ※ Batch of the house. ※ The Damiana leaf is known for its aphrodisiac properties. Light green color. ¡Strong mezcal, should be taken with precaution! ※ Distilled in 2018, produced by the Correa Family. ※ Medicinal mezcal with chumilines (insects- thumbtack alike) added after the distillation process. ※ With high levels of iodine in its content due to the presence of the insect. Prescription for people with thyroid problems, like hypothyroidism. ※ Soft, sweet, almondy and nice flavor. Light golden color due to the presence of the insect. ※ Distilled in July 2017, by Mezcal Master Producer Margarito López. One-year old reposado in glass. ※Cooked in conic earth-oven with Encino wood. Fermented in ayacabuite wood barrels. Double distillation in traditional paxconcli wood alembic, also called “alambique de castaña” which is an even more rustic technique. 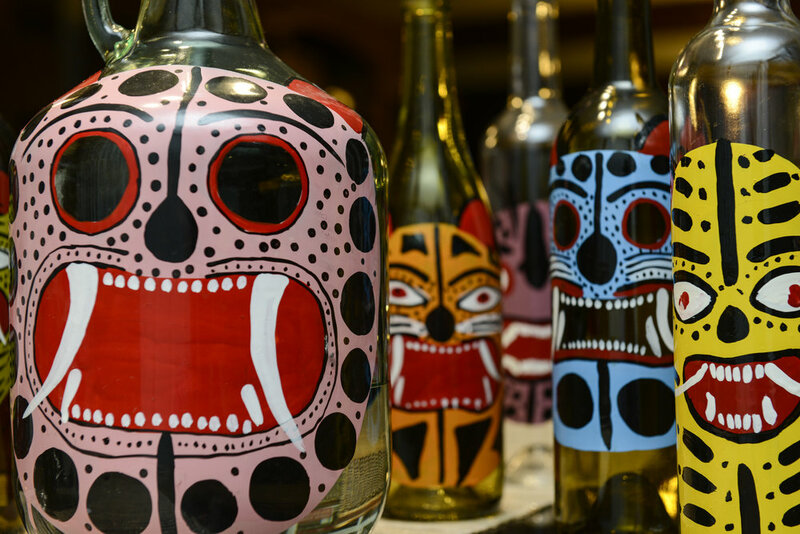 Our bottles are painted by the talented hands of artisans in the Guerrero State. This creations are part of the vast craftmanship that includes textile, masks, furniture, basketry and others. Different representations of the cosmovision of the people from Guerrero are included in the creations of the artisans. The most important is the jaguar. 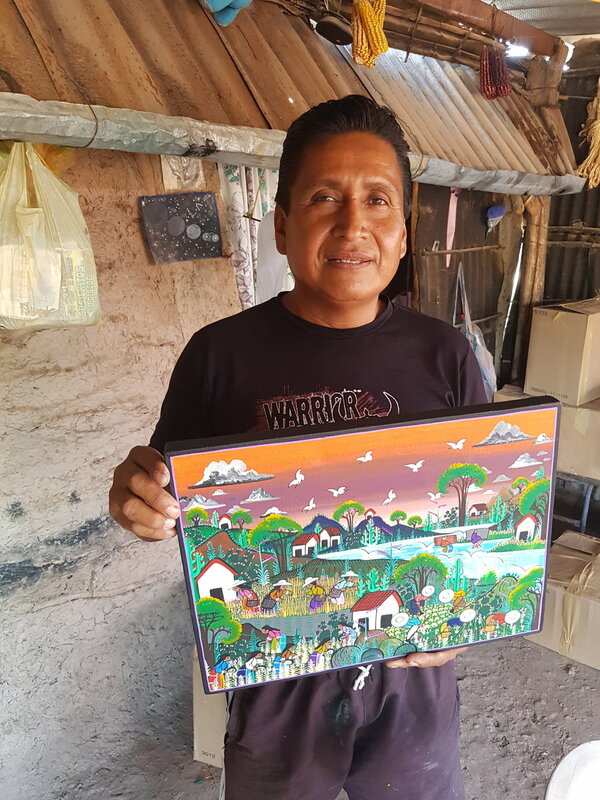 By the moment, La Fiera Mezcal is working with two families of artisans, from two different regions: Center region and the Alto Balsas River region, to paint the unique bottles that represent our project. I have been blessed, because surprisingly I received a gift from my family that will allow me to make a trip that I dreamed for years. I will not be booking tastings, but I will be very happy to place your bookings after this date. Owner and Host of LF La Fiera Mezcal. Andrea was extremely knowledgeable about mezcal from Guerrero, their regional cuisine and their cultural importance. She provides a very unique experience - providing an ever changing roster of mescales paired with Guerrerense pozole, cheese, guacamole in a home tucked away from the exciting bustle of Coyoacán among a lush garden. Thank you Andrea, the food and mezcal were delicious and you were so fun, friendly and informative! - Gaby Guerra, Kingsville, ON. This was a one-of-a-kind experience in Mexico City and would recommend it to anyone visiting! I've enjoyed mezcal for some time, but learning about different types of mezcal, the production, the agave plant, the significance of the jaguar, Guerrero... all of it, was so special and well worth the evening. - Colby Karzen, Los Angeles, CA. We had such a wonderful time with Andrea - it was truly the highlight of my time in Mexico City. I seek experiences that are authentic and local when visiting a new place: I want to get to know what it is people love about their home, and delve into the passions and crafts that make the places I visit so beautiful and special. Andrea was just that: she is an incredible and inspiring female entrepreneur, and her product embodies that spirit in such a unique and wonderful way. Tasting in her living room truly felt like sitting with an old friend over a delicious cocktail, and I'm so glad we found her! - Rachel Tobias, San Francisco, CA. The tasting with Andrea was incredible! She is generous, informative and fun, and it was so great to meet her family (not a part of the tour but a super fun cultural experience)! I loved learning about mezcal and the food pairings were excellent, even the tasting location in her house added a magical element. Highly recommend this experience!- Kaitlin King, Mexico City. Tasting consist of 7 mezcals. This are artisanal made and from small-batch producers in the Guerrero State (second national producer after Oaxaca), you won’t find them anywhere else but going to the small towns where they are made. We will taste natural mezcals as well as curados, which are mezcals with flavour added, like worm, passion fruit or Damiana leaf. We will pair the mezcals with traditional snacks from Guerrero, such as cincho and fresh cheese, pumkin sees, chalupas, green mole, and other seasonal snacks. As your host I will explain the particularities of each mezcal, the history of this traditional spirit and I will guide on how to recognise a good mezcal. I am open and glad to answer all your questions related to the mezcal history and production. Estimated time: 3 - 4 hours. 1 bottle of mezcal included per person. Extra bottles and glass shots available for purchase. Group fee for 4 people up. WE ALSO TAKE BOOKINGS VIA GYDEANDSEEK.COM CLICK HERE! TO FIND OTHER CULTURAL ACTIVITIES WITH LOCAL GUIDES. If you are in the city and want to buy our products, or book a mezcal tasting, please fill in this form and we will contact you as soon as posible. *Unfortunately, we do not sell our products or ship to the US or Europe. Your information is safe. We will not use you data for other use that to respond to your request.